With the NSA around, who needs fiction any more? Using Angry Birds to spy on people? Priceless! It’s the perfect mash-up of time wasting app with full on 1950s paranoia. Rovio married to Hitchcock. In The Birds, we never do find out why those birds are so angry at Tippie Hedren nor is it clear in the game what the swine have done to merit such hatred. All we know is that the threat is constant. Pigs just don’t seem to have the same existential charge as birds though. Pigs, after all, are mammals like ourselves. Birds might be warm blooded but they’re still reptiles descended from the dinosaurs. It’s hard enough to know what your cat thinks of you—good luck with the birds. We all like watching the sea gulls at the seashore but just try eating a hotdog there. Crows can also be creepy. Why else would a group of them be termed a murder? Just a few days ago a sea gull and a crow got together to attack some peace doves released by the Pope. 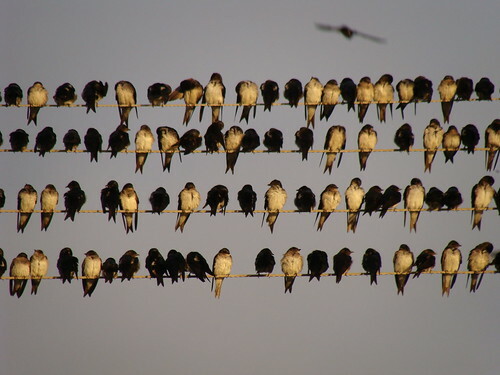 Birds have a pecking order, too. Just ask Amazon. Its delivery drones are getting taken down by hawks who aren’t accustomed to sharing the skies. The drones are fighting back though. Or rather, the U.S. Army is. Now it’s making its drones look less like drones and more like birds. Soon it will be equipping its troops with flocks of them. What’s that at your bird feeder, you ask? The beady-eyed character with a sharp beak and no interest in seeds? Is it a bird? Is it a plane? No, it’s just the latest technology coming soon to a location very near you. Promise.